We love to observe human connections, and what better setting to do so than the time and place that you exchange your wedding vows? Let us tell your love story in a series of intimate and authentic images that you will treasure for years to come. You’ll find Leonard’s Palazzo nestled on Long Island’s Gold Coast. This timeless venue has all the elegance of the classic Gold Coast as well as a contemporary ambiance created by the creative team of event management and catering professionals. As a Leonard’s Palazzo bride you will be impressed with the opulent interior décor combined with the most modern amenities you will need for your special occasion. And the exterior is just as amazing, with its tranquil patios and romantic garden. You will delight in soaking up the serene atmosphere. No wonder this venue has been used as a location for the production of HBO and 20th Century Fox films. 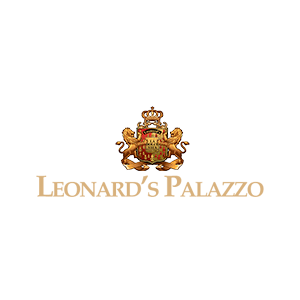 The combination of impeccable white glove service, sumptuous cuisine, and incredible ambiance makes Leonard’s Palazzo the perfect venue for your wedding. You and your guests will be welcomed to Leonard’s tradition with open arms. Your dream wedding becomes a reality at Leonard’s Palazzo. You are a princess bride within a world of delightful enchantment. Upon arriving, you and your friends and family will be escorted from your cars by the Palazzo’s white-gloved attendants. As you drift into the opulent lobby lit by twinkling crystal chandeliers, you will be led to your bridal room, which appears straight out of the pages of a fairy tale. Shortly after the attendant announces the beginning of the cocktail hour and the Palazzo’s talented mixologists tend stunning, onyx-surfaced bars while you and your guests chat and sip on delicious drinks and hors-d’oeuvres created by the venue’s award-winning master chef and his European-trained culinary team. As the magical night continues, you and your friends and family can stroll around the breathtaking 19th-century estate, exploring the exquisite gardens and marveling at the tranquil beauty of the place. The Continental Room: This 2,950-square-foot room is lit by crystal chandeliers and has the capacity to accommodate 135 guests with buffet seating or 150 guests for a formal banquet. The Empire Room: With 2,240 square feet of space, this room can accommodate up to 100 guests. The Tiffany and Crystal Room: This room offers 4,790 square feet of space to accommodate to 250 guests. The Holiday and Parisian Room: This 3,250-square-foot space accommodates up to 160 guests. The Leonardo da Vinci Veranda: This 6,000-square-foot space accommodates up to 280 guests. The Grand Ballroom: This 7,640-square-foot space accommodates up to 850 guests. Booking a wedding photographer is a huge decision, so let’s get together, and we can show you why we are the best choice for your Palazzo wedding. Once you take a look at our portfolio, you will be smitten. We look forward to getting to know you.